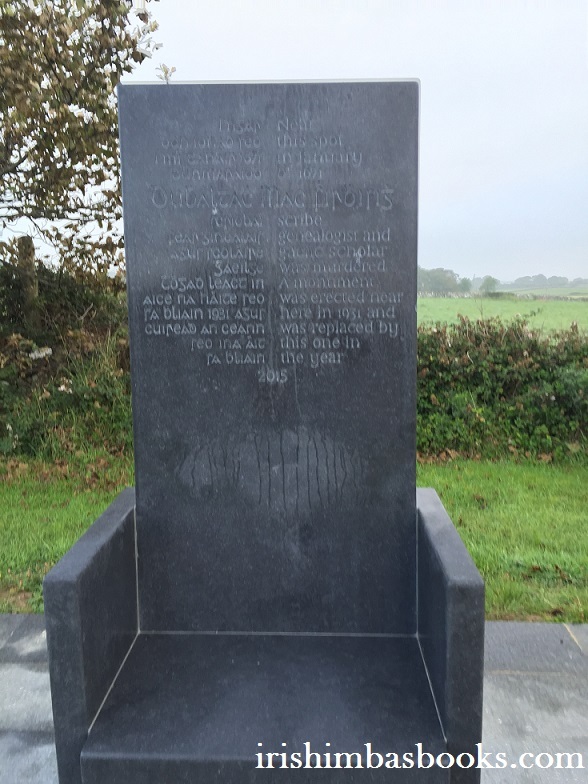 Several years ago while visiting a friend I found a concrete chair set up a ditch on the side of the road in the townland of Doonflin. Fascinated, I stopped the car to have a look and try to work out what it was. Because of its dilapidated condition, the writing engraved on it was almost completely erased. I drove past it again a few other times but the only people around that I could ask were either tourists or knew only that it was a monument to someone who’d been murdered in the vicinity. One person told me it was called ‘The Bard’s Chair’. Although I was intrigued I didn’t have time to research it any further so I just let it go and went my way. Not long ago, my friend contacted me and mentioned that the concrete chair had been removed but, fortunately, replaced by a new chair and an information panel that explained its predecessor. 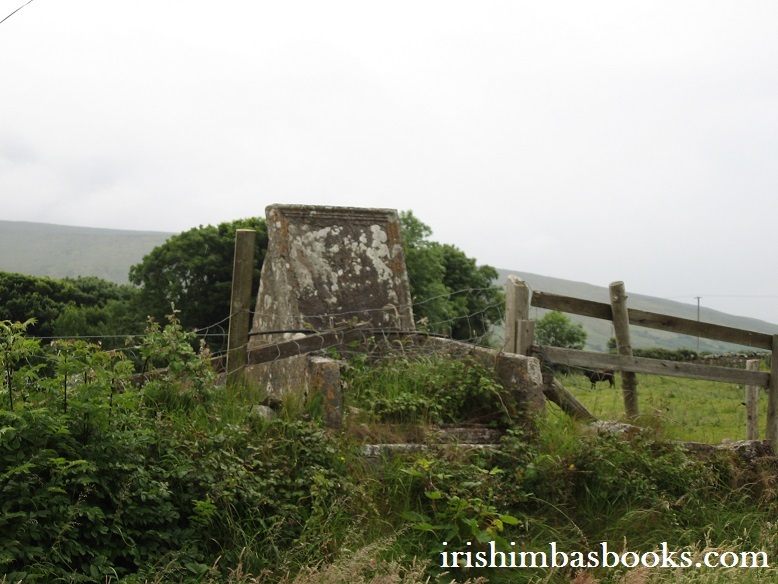 Apparently, the original had been constructed sometime in 1931-34 when the road was still a quiet botharín (little road) and was a monument dedicated to Dubhaltach MacFhirbhisigh, a famous Irish writer most people have never heard of. 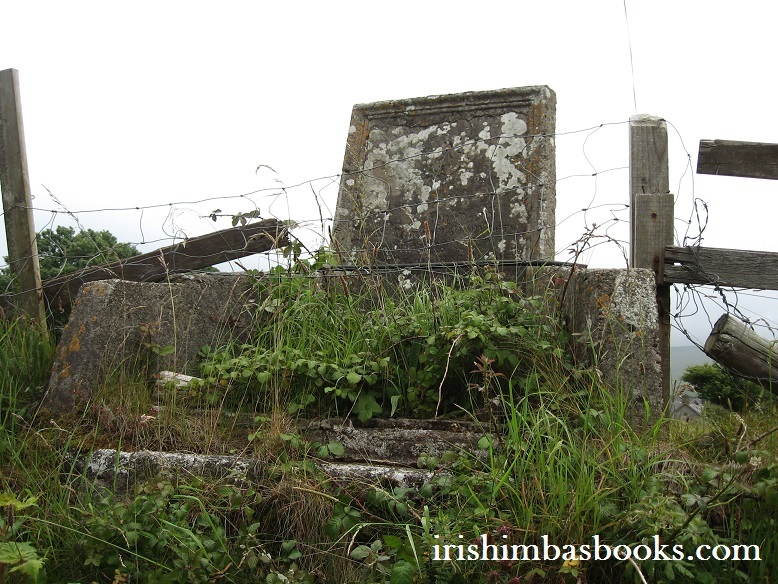 Dubhaltach MacFhirbhisigh was a member of Clan MacFhirbhigh (Mac Firbis in English), a family whose original territory was north Connacht (their descendants can still be found predominantly around Ballina in County Mayo). This clan were the hereditary poets and historiographers to the O’Dowds of Tireragh (an area that stretched along the west coast of Co. Sligo) from the 12th to the 17th centuries. 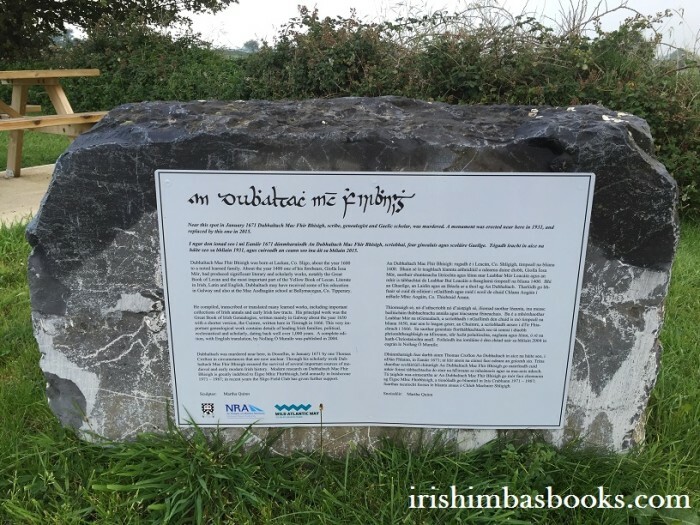 Dubhaltach MacFhirbhisigh was one of the last Gaelically trained scribes of his day and is best known for his work Leabhar na nGenealach (the Great Book of Irish Genealogies). 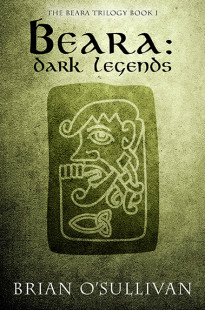 This work compiled Irish genealogical lore relating to the key Gaelic and Anglo-Norman families of Ireland from pre-Christian times to the mid-17th century. 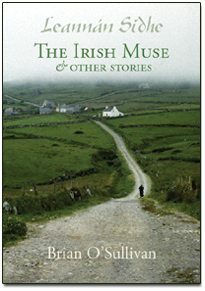 To understand the significance of that you need to understand a bit about the context of the literary caste in Ireland from about the ninth century onwards. Essentially, this group held an official place in the Gaelic social system, they were extremely well educated (trained through a Gaelic educational system independent of the Christian system – although they eventually overlapped) and were immensely respected. In Gaelic Ireland, most Irish dynasties employed these men of learning as their official poets and genealogists/historians, and occasionally advisors (although the latter decreased over the centuries). In essence, these scholar-scribes were the direct descendents of the druidic class and responsibility for their role was passed down through select families from generation to generation. At the time Dubhaltach MacFhirbhisigh was active (1640 to 1671), Ireland was undergoing a period of immense societal change. Due to the encroachment and increasing military influence of the English crown, most of the great hereditary Irish dynasties had fallen (or were in the process of it) and as a result, these scribes no longer had patrons to support or employ them. Some made a living doing translations, researching and writing genealogies and transcriptions for a dwindling number of clients. Others – despite their immense intellect and education – ended up doing the most basic of menial tasks. In a contemporary sense, this impact would be the same as if someone took over your country today and forced all of your university academics to make a living through manual labour (and you may have your own views on that). These men were an essential part of Gaelic culture but by the end of the 1600s, their positions were eroded just as effectively as the memorial writing on the original concrete chair. Although we don’t know much about Dubhaltach MacFhirbhisigh, what we do know was that he was a supremely educated and competent (but, more importantly, a fanatically dedicated) scribe. At the time he was producing some of his greatest works in the Galway region (around 1949) bubonic plague had broken out in the city (causing an evacuation by most of the population). He was also in the environs around July 1650, when English parliamentary forces crossed the Shannon and began a nine-month siege of the city. Preoccupied with his own literary projects however, MacFhirbhisigh never makes reference or commentary on the activities taking place around him (except once where it disturbed his work). What’s even more amazing is that despite all the violence and furore taking place around him, he managed to produce works that far exceed those of the scribes before him, often without any financial support. The Leabhar na nGenealach, for example is almost as large and as detailed as the more famous Annals of the Four Masters which was produced by a whole teams of scholars around the same period. Quite frankly, MacFhirbhisigh was the ultimate scholar. Nothing mattered as much to him as research and knowledge. MacFhirbhisigh truly was an astonishing individual in that he managed to save the history and records of Gaelic culture and allow them to be passed on for future generations at a time when other forces were doing all in their power to destroy that culture. Most of the source material he used no longer exists and if he hadn’t worked with the almost manic determination he did, we would have a much lesser understanding of our ancestors today. For that, at least, he deserves his chair – and his story – preserved for future passers-by along the road.